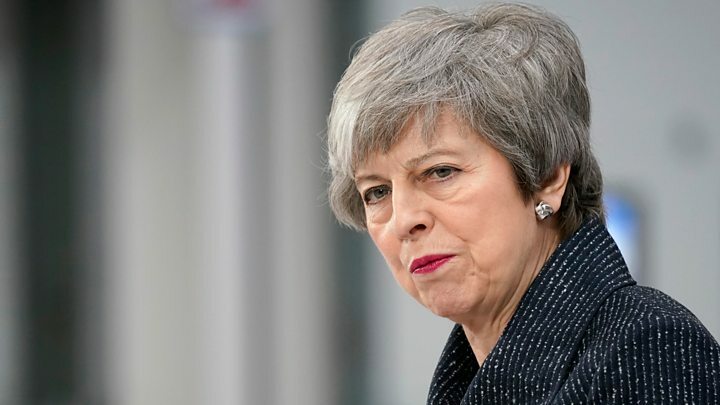 Media captionPM Theresa May: "Now is the moment for us to act"
Theresa May has asked the EU for "one more push" to get her Brexit deal through Parliament and warned that, if it fails, "we may never leave at all". The prime minister said the UK had tabled "serious" proposals to resolve the deadlock over the Irish backstop. Warning of a "moment of crisis" if the deal was rejected again, the PM told EU leaders: "Let's get it done." The EU said it would give "legal force" to assurances already made that the UK could not be stuck in a customs union. Setting out the EU's position on Twitter, chief Brexit negotiator Michel Barnier said it was "not interested in the blame game" and talks would continue over the weekend. The BBC's political editor Laura Kuenssberg said what the EU was offering amounted to a "legal beefing-up of existing promises". Brexit Secretary Steve Barclay and the DUP, the party Mrs May's government relies on for a majority in Parliament, were both dismissive of Mr Barnier's proposal. Mr Barclay tweeted: "With a very real deadline looming, now is not the time to rerun old arguments. The UK has put forward clear new proposals. We now need to agree a balanced solution that can work for both sides"
While Nigel Dodds, the deputy leader of the DUP, said Mr Barnier's proposal regarding the backstop "disrespects the constitutional and economic integrity" of the UK, and it was neither "realistic nor sensible". He said the EU's proposal "demonstrates that they have a one-sided approach and a lack of understanding about the divisions in Northern Ireland". MPs will vote for a second time on the withdrawal deal Mrs May has negotiated with the EU on Tuesday - after it was defeated by a historic margin in a Commons vote in January. In a speech to a green energy firm in Lincolnshire, Mrs May said she understood the "genuine concerns" about the backstop but appealed to MPs to recognise that the deal as a whole respected the 2016 referendum result and would ensure the UK's long-term prosperity. "Back it and the UK will leave the EU," she said. "Reject it and no-one knows what will happen. We may not leave the EU for many months. We may leave without the protections a deal provides, we may never leave at all." It was in neither side's interest to prolong the uncertainty by "carry on arguing" about Brexit, she said, claiming any delay beyond 29 March only risked "creating new problems". "It needs one more push to address the specific concerns of our Parliament," she said. "So let's not hold back and do what is necessary for MPs to back the deal. "Because if MPs reject the deal, nothing is certain. It would be at a moment of crisis." She suggested the British people, to whom Brexit "belonged", had "moved on" and "are ready for this to be settled", adding: "Everyone now wants to get it done." But former Conservative minister Dominic Grieve, who backs a referendum to endorse the terms of Brexit, said it was "hard to see" how Parliament would agree to the current deal. Speaking at the Scottish Labour conference, party leader Jeremy Corbyn said the prime minister sounded "desperate" in her speech. "If she cannot get her botched Brexit deal through Parliament next week, it will represent an unprecedented failure in British political history. "The utter mess the government has made of the Brexit negotiations, and their reckless abandon when it comes to people's jobs and livelihoods, is absolutely unforgiveable. "Having already failed once to get her deal through, I want to make it clear to the PM that if she fails again, it will be the end of the road for her deal." The SNP said the deal on offer was "fundamentally flawed" and would damage the Scottish economy. "Theresa May must stop passing the buck and take personal responsibility for the Brexit crisis created as a result of her own intransigence," said its Westminster leader Ian Blackford. 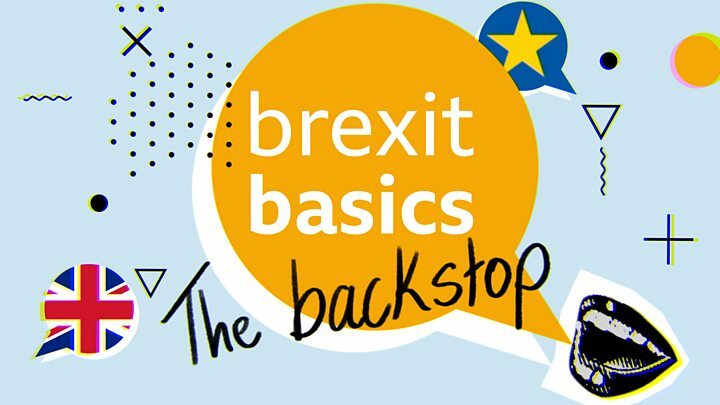 Mrs May is seeking legally enforceable changes to the backstop - a controversial insurance policy designed to prevent physical checks on the border between Northern Ireland and the Republic of Ireland - but there have been few visible signs of progress. Leading Brexiteers are looking for reassurances that the backstop - which would see the UK aligned with EU customs rules until the two sides' future relationship is agreed or alternative arrangements worked out - will not endure indefinitely. Michel Barnier tweeted that the UK "will not be forced into [a] customs union against its will" as it could choose to exit the proposed "single customs territory" on its own. But Northern Ireland would remain part of the EU's customs territory, subject to many of its rules and regulations - something the government has previously said would threaten the constitutional integrity of the UK. There will also be a reminder that the UK can suspend parts of the backstop if an independent arbitration panel rules that the EU is not behaving in good faith. The BBC's Laura Kuenssberg said it was "not really a concession" as the suggestion that Great Britain could leave the backstop - and become free to diverge from EU rules - while leaving Northern Ireland behind, had already been rejected. Any extension to the Article 50 process, under which the UK is due to leave the EU on 29 March, would need the unanimous approval of the EU. Two former prime ministers, Sir John Major and Gordon Brown, have called for a delay of a year to allow for a "public consultation" on the way ahead and to ensure an orderly exit. But Defence Secretary Gavin Williamson warned against any delay, telling Nick Robinson's Political Thinking podcast: "Wherever we are, and I very much hope we land it with a deal, but if we don't get a deal and we exit without a deal, Britain will succeed and thrive - I don't have a moment's doubt about that. "But we need to deliver Brexit and ensure that's it's done. I personally believe 29th March is the best day for making sure that is delivered upon."